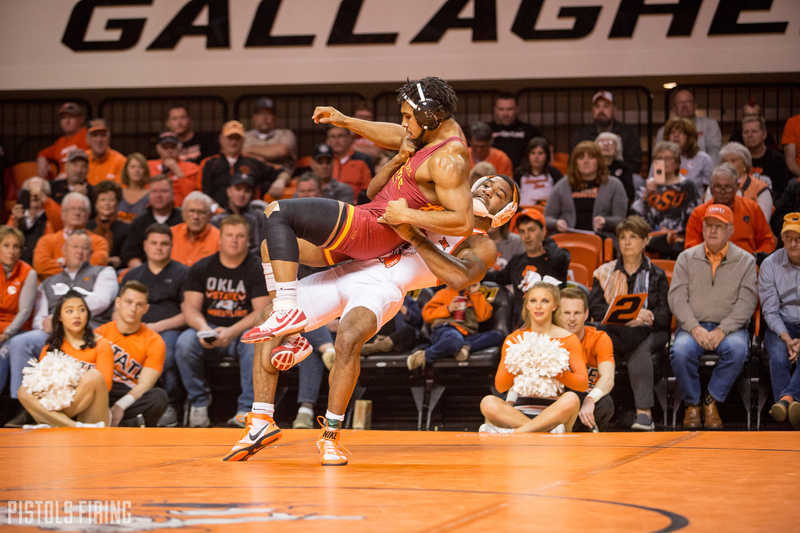 OSU picked up a solid win over a tough Northern Iowa team in Gallagher-Iba Arena on Friday night. Here’s a quick recap. You may be sick of me saying all of Kaden Gfeller’s matches are fun, but they just are. I don’t think he knows any other way to do it. In an insane come-from-behind win Gfeller gets a last-second takedown at the end of regulation to send the match to overtime. In sudden victory he finishes it off with a quick score to pick up his fourth ranked win of the season. Kaid Brock and Joe Smith were both up late in big matches against highly ranked opponents. Both looked good throughout most of the match and were leading late. Both lost in very similar fashion after giving up takedowns in the final seconds. Jacobe Smith is wrestling up from his natural weight. In his first tournament after moving up to 184, it seemed clear he would have to make some adjustments to have the same success he was having at 174. It looks like he’s figured that out. Smith absolutely dominated All-American Drew Foster 8-4. He wrestled about as well as we’ve seen him this season at 184. OSU’s attendance was a bit down with this one. They have a chance to break a record average this season. The mark they now have to make over the next three duals is 17,771. The finale vs. Iowa will be a big draw, but they’ll need better numbers than they had here vs. Lehigh and Air Force to have a shot.